LONDON (Reuters) - Britain's Prime Minister Theresa May is open to the idea of extending the transition period "for a few months", BBC Political Editor Laura Kuenssberg said on Twitter. 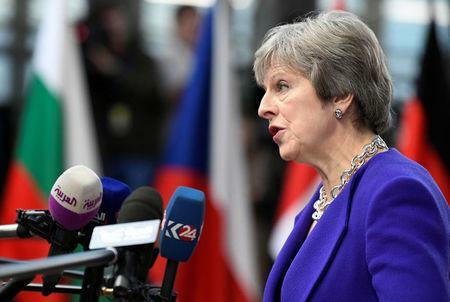 EU leaders have raised the possibility that the post-Brexit transition period, during which Britain would retain EU rules, could be extended by a year as a way to give London more time to agree the EU-UK customs deal it wants to solve the issue of the Irish border. But so far, May has repeatedly ruled out extending the transition period. Kuenssberg suggested on Thursday that May could be open to an extension of a few months, but any move to do so would be highly unpopular with hardline supporters of Brexit within her party.